Jon dreams of unlocking his true powers, something is preventing them from manifesting properly but Damian, Clark and Lois are more concerned that Batman has gone missing. Cobb & Kathy Branden interrupt the morning with a delivery of milk and as they leave Cobb uses a mysterious ability to hypnotize Krypto. Later that day, whilst searching Hamilton County in their costumed identities, a giant octopus (last seen in Superman Rebirth #2) attacks the town. 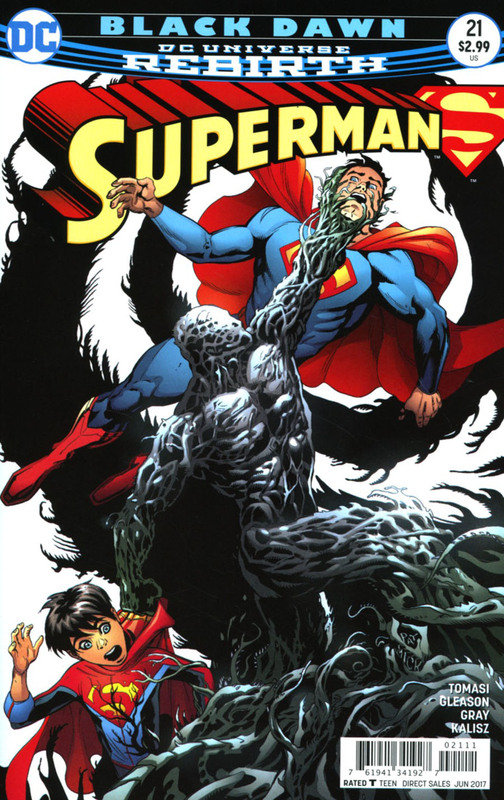 The octopus oozes black ink all over Superman and it manifests itself into a man holding a cigar which proceeds to multiply and attempt to overpower the trio. Reluctant to kill the sea creature, Superman hurls it back into the water and throws a ferris wheel on top of it to pin it down. The townsfolk are disappointed that Superman didn't kill it and when it returns for a second attack, Jon, in a rage, unleashed the full fury of his heat vision. A disappointed Clark leads the boys away and is further taken aback when Damian reveals that Jon and Kathy had lied to sneak into Deadman's swamp looking for Bess the cow and Bruce might be trapped in it too. Story - 2: There is one thing that really bugs me... Jon kills again... with Clark's full knowledge. Clark shows disappointment but it was more to do with his son lying than taking a life and the fact the populace compared him with his son in a negative light. I'm sorry - what?? The mystery of Cobb and Kathy Branden has been bubbling away for months now and it looks like we are finally going to get some answers as to why Jon is so important to them but I'm still reeling from Clark's parenting to care. Who is that mysterious cigar smoker? What the heck just happened to Kathy and if she harbored that secret why did she need his help in Deadman's swamp? The manipulations of the Kent's seems to be never-ending and then on top of all that the giant octopus returns, yet even with all of this I can't see past the killing. Something puzzling about the Brandens is that they intervene when Batman and Robin pose threats however minor the conflict to the Kents but they don't interfere when Other Clark caused issues and Poison Ivy tortured their family and friends. Oh yes and Jon kills again. Can you tell I'm shocked with Clark here? I hope Lois tows the line as a parent here. Art - 5: Sometimes Gleason's art feels a little off kilter when matched with the story, an example of that was the Reborn storyline where all the characterizations were exaggerated. Then an issue like this arrives and it fits like a glove. The bizarre attack of the octopus in Hamilton County with the added appearance of three superheroes in such a quiet town doesn't seem quite that weird when all the pieces are put together. Cover Art - 3: The top half of the cover has some great pencil work but the bottom featuring Jon doesn't seem to fit the threat level. The coloring also makes the cover look less of a threat because it is too light and bright. The while areas, I feel, work against the artwork. 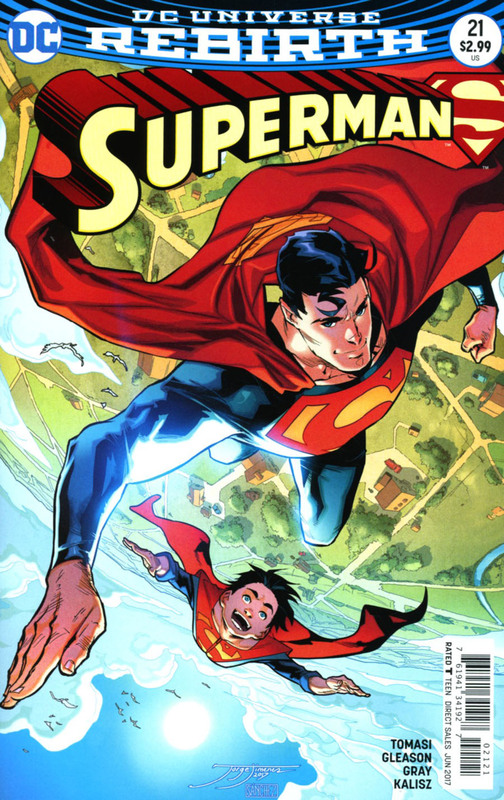 Variant Cover Art - 5: I absolutely love this cover, seeing iconic imagery like this, with Superman and his son soaring through the skies, genuinely happy and enjoying their lives. It is a vision of optimism, it just really fills you with a positive outlook for the hero and his mythos.